Toyota has recently made some bold proclamations about it’s future plans regarding commitment to alternative fueled vehicles. Yesterday they announced that they anticipate selling more than 30,000 fuel-cell vehicles by the year 2020. Toyota also announced they have a goal to sell 1.5 million hybrid gasoline-electric vehicles annually starting that same year. By 2050 they intend to reduce their own carbon emissions to zero, where currently gasoline and diesel engine cars make up 85% of global sales. With their new CEO, Akio Toyoda at the helm, their days of conservative leanings are over. Encouraging bold new engineering and creative designs, Toyoda is taking their brand down an exciting new road. With technological advancements are prevalent everywhere and the best place to buy a car online is a current and future reality, Toyota is ready to lead the race to produce the best cars of tomorrow, even today. One of the bigger changes that the 2016 Prius is getting is the TGNA, or the New Global Architecture. It is a new platform introduced by Toyota to simplify and make design more efficient by reducing the number of platforms and architectures. Lighter and more compact than previous platforms this proves to be its biggest advantage. Being used on both the front and rear wheel drives allows the engine to be placed lower in the car providing a more stable, secure and efficient driving experience. This system is also proving to be more cost efficient for Toyota which in turn they’ll use to invest in future technologies for the Prius, like an autonomous driving system. the Prius is trying to set a new standard, again. While the 2016 Prius is keeping the same engine as its 2015 model, it does get a revamp. The 1.8L DOHC VVT-i Atkinson-cycle 4 cylinder engine is estimated to save 3% in fuel efficiency. The base model Prius’ will keep the tried and true nickel-metal hydride battery pack but due to upgrades it is expected to provide more efficiency. Higher ECO trim models will receive a newer power dense lithium ion battery, which have been in the currently plug-in Prius models. The ECO trim models will also contain super-capacitors which will capture much more energy during regenerative braking periods than batteries alone. While the 2015 Plug-In was halted from production halfway through this year, Toyota has not scrapped the idea altogether. We already know the 2016 Prius Plug-In is said to offer a 30-35 mile range on the battery alone, which is a substantial increase from the previous 11 mile range. Production for the 2016 Plug-In is slated to begin the second half of 2016. Given Toyota is as shy with the Plug-In Prius as they are with the hybrid, we may not see its release until 2017. The Japanese automaker has already outlined a series of ambitious goals that target environmental issues. The first to tackle is emissions. Planning to cut roughly half the emissions generated by production in 2001, by 2020, they want another third cut by 2030. Lofty ideals, but why not reach for it? So far, nothing seems impossible for Toyota’s engineers. Toyota also plans on cutting emissions generated by new vehicles 22% by the end of the decade. By 2050 they say this will cut emissions from new vehicles by 90% while eliminating its factories emissions altogether. Focusing on hydrogen as an alternative to gasoline, Toyota launched their first hydrogen fueled concept car in 2014, the Mirai. By this summer, they officially started selling it to a very limited customer base in California. With a goal to sell 30,000 units by 2020, they have a lot of increased production to meet. It’s not just Toyota who has to up their ante. 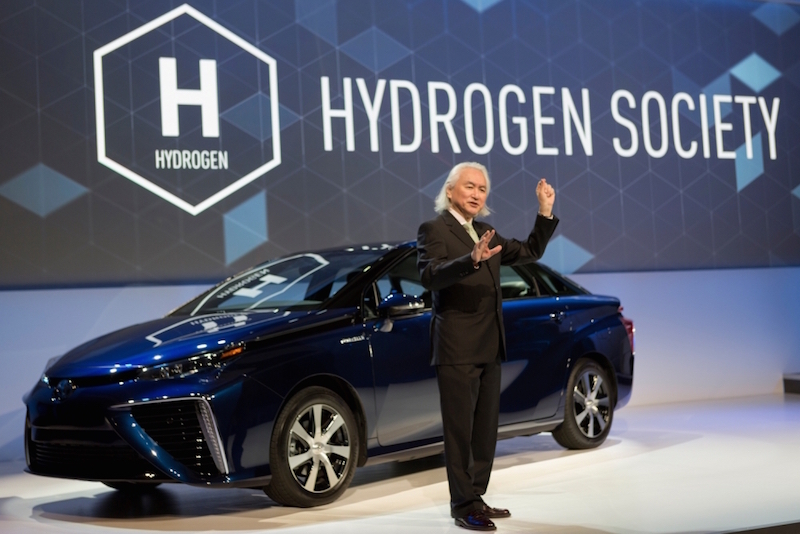 Toyota can only sell hydrogen fuel cell cars to states who carry the infrastructure to do so. Currently, California is the only state that can meet these needs. 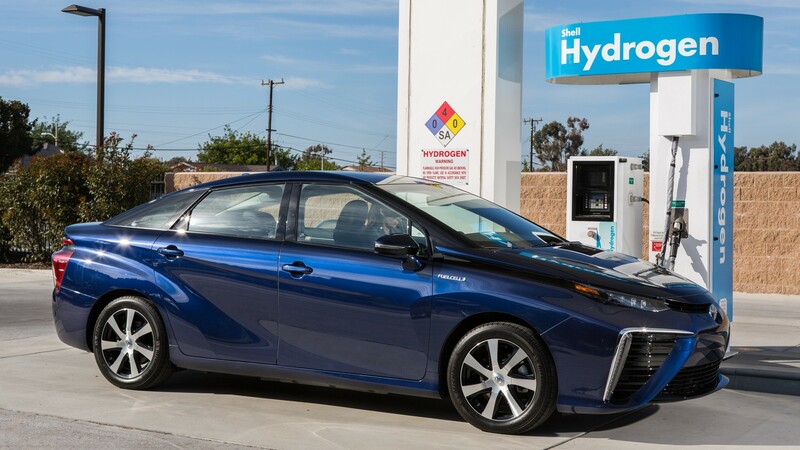 Toyota has taken a serious amount of grief for their hydrogen ambitions because of the lack of infrastructure which poses logical, economical and environmental challenges it poses. Luckily for us, this is Toyota’s first time dealing with this amount of skepticism. Back in 1997 when they announced their concept for the Prius, they were met with naysayers at every turn and kept going regardless. Currently, the Prius has sold over 3.3 million in cumulative worldwide sales. Who’s the joke on now? Because Japan is so much more willing to support the infrastructure that is needed for hydrogen vehicles, Toyota’s engineers move forward with their vision and plans for the future. Wanting to foster a ‘hydrogen-based society’ where hydrogen will be used in manufacturing as well as in local transportation, they have created fuel cell patents that will be freely available. Collaborating with other automakers who support their vision is also part of this plan. After 20 years, Toyota has finally completed its first hydrogen-powered vehicle. This exciting hydrogen powered vehicle plans leading America down a new path of fuel celled vehicles. Even though a fuel celled vehicle, or FCV, has been in the works for Toyota since the same time as work began on the Prius, the practicality of its arrival hasn’t been around as long. Fuel cells work when the combining hydrogen and oxygen across a catalyst to produce an electric current. The only byproduct of using hydrogen as fuel is water vapor. Once hydrogen has been pumped into the vehicle, it is stored in carbon fiber fuel tanks where it is then called upon for use. It’s usage is quite efficient getting an optimum of 300 miles per gallon. 300 miles. That should be enough to make even the biggest skeptics eyes widen. 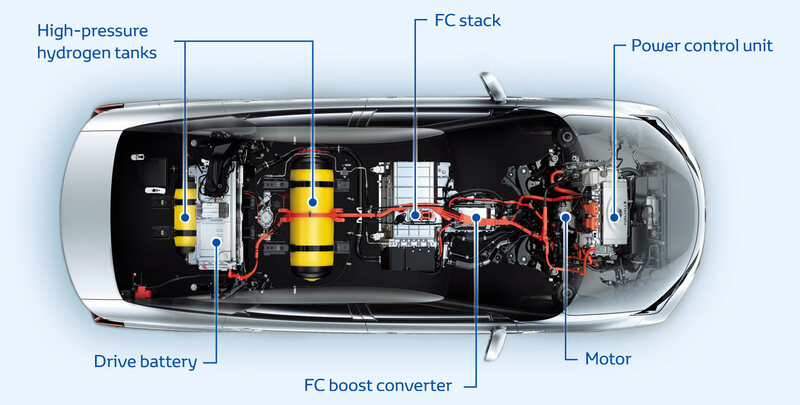 The onboard hydrogen fuel cells generate the electricity which powers the 153 horsepower electric motor. While 153 horsepower can be a less than impressive number, the instant torque of electric vehicles gives the impression of much more power. The hydrogen tanks and fuel cells are placed in the middle lower of the car which provides a greater center of gravity and with better weight distribution than gas powered cars. This means that it is actually better than its 4,078 lb. curb weight which adding to its prowess.